Prior to establishing the nation's capital in Washington, D.C., the United States Congress and its predecessors had met in Philadelphia (Independence Hall and Congress Hall), New York City (Federal Hall), and a number of other locations (York, Pennsylvania; Lancaster, Pennsylvania; the Maryland State House in Annapolis, Maryland; and Nassau Hall in Princeton, New Jersey). In September 1774, the First Continental Congress brought together delegates from the colonies in Philadelphia, followed by the Second Continental Congress, which met from May 1775 to March 1781. The United States Congress was established upon ratification of the United States Constitution and formally began on March 4, 1789. New York City remained home to Congress until July 1790, when the Residence Act was passed to pave the way for a permanent capital. The decision of where to locate the capital was contentious, but Alexander Hamilton helped broker a compromise in which the federal government would take on war debt incurred during the American Revolutionary War, in exchange for support from northern states for locating the capital along the Potomac River. As part of the legislation, Philadelphia was chosen as a temporary capital for ten years (until December 1800), until the nation's capital in Washington, D.C., would be ready. 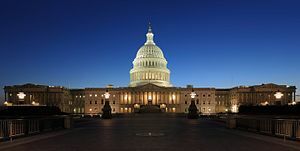 The word "capitol" has since been adopted, following the example of the United States Capitol, in many jurisdictions also for other government buildings, for instance the "capitols" in the individual capitals of the states of the United States. This, in turn, has led to frequent misspellings of "capitol" and "capital". The former refers to a building which houses government institutions; the latter refers to the entire city. The Senate (north) wing was completed in 1800. The Senate and House shared quarters in the north wing until a temporary wooden pavilion was erected on the future site of the House wing which served for a few years for the Representatives to meet in, until the House of Representatives (south) wing was finally completed in 1811, with a covered wooden temporary walkway connecting the two wings with the Congressional chambers where the future center section with rotunda and dome would eventually be. However, the House of Representatives moved early into their House wing in 1807. Though the Senate wing building was incomplete, the Capitol held its first session of the United States Congress with both chambers in session on November 17, 1800. The National Legislature was moved to Washington prematurely, at the urging of President John Adams, in hopes of securing enough Southern votes in the Electoral College to be re-elected for a second term as President. 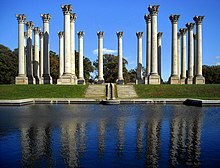 It is no exaggeration to say that on Sundays in Washington during the administrations of Thomas Jefferson (1801–1809) and of James Madison (1809–1817) the state became the church. Within a year of his inauguration, Jefferson began attending church services in the chamber of the House of Representatives. Madison followed Jefferson's example, although unlike Jefferson, who rode on horseback to church in the Capitol, Madison came in a coach and four. Worship services in the House—a practice that continued until after the Civil War—were acceptable to Jefferson because they were nondiscriminatory and voluntary. Preachers of every Protestant denomination appeared. (Catholic priests began officiating in 1826.) As early as January 1806 a female evangelist, Dorothy Ripley, delivered a camp meeting-style exhortation in the House to Jefferson, Vice President Aaron Burr, and a "crowded audience". The 1850 expansion more than doubled the length of the Capitol, and dwarfed the original, timber-framed, copper-sheeted, low dome of 1818, designed by Charles Bulfinch which was no longer in proportion with the increased size of the building. In 1855, the decision was made to tear it down and replace it with the "wedding-cake style" cast-iron dome that stands today. Also designed by Thomas U. Walter, the new dome would stand three times the height of the original dome and 100 feet (30 m) in diameter, yet had to be supported on the existing masonry piers. Like Mansart's dome at "Les Invalides" (which he had visited in 1838), Walter's dome is double, with a large oculus in the inner dome, through which is seen "The Apotheosis of Washington" painted on a shell suspended from the supporting ribs, which also support the visible exterior structure and the tholos that supports The "Statue of Freedom", a colossal statue that was raised to the top of the dome in 1863. The weight of the cast iron for the dome has been published as 8,909,200 pounds (4,041,100 kg). With the increased use of technologies such as the internet, a bid tendering process was approved in 2001/2002 for a contract to install the multidirectional radio communication network for wifi and mobile-phone within the Capitol Building and annexes, followed by the new Capitol Visitor Center. The winning bidder was an Israeli company called Foxcom which has since changed its name and been acquired by Corning Incorporated. The Capitol building is marked by its central dome above a rotunda in the central section of the structure (which also includes the older original smaller center flanked by the two original (designed 1793, occupied 1800) smaller two wings (inner north) and inner south) containing the two original smaller meeting chambers for the Senate and the House of Representatives (between 1800 and late 1850s) and then flanked by two further extended (newer) wings, one also for each chamber of the larger, more populous Congress: the new north wing is the Senate chamber and the new south wing is the House of Representatives chamber. Above these newer chambers are galleries where visitors can watch the Senate and House of Representatives. It is an example of the neoclassical architecture style. 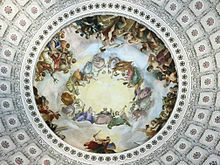 The 1865 fresco painted by Constantino Brumidi on the interior of the Capitol's dome is titled The Apotheosis of Washington (2005 view). Carlo Franzoni's 1819 sculptural chariot clock, the Car of History, depicting Clio, the Greek muse of history. 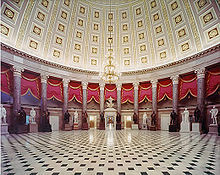 National Statuary Hall (2006 view). The Capitol has a long history in art of the United States, beginning in 1856 with Italian/Greek American artist Constantino Brumidi and his murals in the hallways of the first floor of the Senate side of the Capitol. The murals, known as the Brumidi Corridors, reflect great moments and people in United States history. Among the original works are those depicting Benjamin Franklin, John Fitch, Robert Fulton, and events such as the Cession of Louisiana. Also decorating the walls are animals, insects and natural flora indigenous to the United States. Brumidi's design left many spaces open so that future events in United States history could be added. Among those added are the Spirit of St. Louis, the Moon landing, and the Space Shuttle Challenger crew. Brumidi also worked within the Rotunda. He is responsible for the painting of The Apotheosis of Washington beneath the top of the dome, and also the famous Frieze of American History. The Apotheosis of Washington was completed in 11 months and painted by Brumidi while suspended nearly 180 feet (55 m) in the air. It is said to be the first attempt by the United States to deify a founding father. Washington is depicted surrounded by 13 maidens in an inner ring with many Greek and Roman gods and goddesses below him in a second ring. The frieze is located around the inside of the base of the dome and is a chronological, pictorial history of the United States from the landing of Christopher Columbus to the Wright Brothers's flight in Kitty Hawk, North Carolina. The frieze was started in 1878 and was not completed until 1953. The frieze was therefore painted by four different artists: Brumidi, Filippo Costaggini, Charles Ayer Whipple, and Allyn Cox. The final scenes depicted in the fresco had not yet occurred when Brumidi began his Frieze of the United States History. The Capitol also houses the National Statuary Hall Collection, comprising two statues donated by each of the fifty states to honor persons notable in their histories. One of the most notable statues in the National Statuary Hall is a bronze statue of King Kamehameha donated by the state of Hawaii upon its accession to the union in 1959. The statue's extraordinary weight of 15,000 pounds (6,800 kg) raised concerns that it might come crashing through the floor, so it was moved to Emancipation Hall of the new Capitol Visitor Center. The 100th, and last statue for the collection, that of Po'pay from the state of New Mexico, was added on September 22, 2005. It was the first statue moved into the Emancipation Hall. On the ground floor is an area known as the Crypt. It was intended to be the burial place of George Washington, with a ringed balustrade at the center of the Rotunda above looking down to his tomb. However, under the stipulations of his last will, Washington was buried at Mount Vernon. The Crypt houses exhibits on the history of the Capitol. A compass star inlaid in the floor marks the point at which Washington, D.C. is divided into its four quadrants and is the basis for how addresses in Washington, D.C., are designated (NE, NW, SE, or SW). Within the Crypt is Gutzon Borglum's massive Abraham Lincoln Bust. The sculptor had a fascination with large-scale art and themes of heroic nationalism, and carved the piece from a six-ton block of marble. Borglum carved the bust in 1908, and it was donated to the Congress by Eugene Meyer, Jr., and accepted by the Joint Committee on the Library, in the same year. The pedestal was specially designed by the sculptor and installed in 1911. The bust and pedestal were on display in the Rotunda for many years until 1979 when, after a rearrangement of all sculpture in the Rotunda, they were placed in the Crypt. Borglum was a patriot; believing that the "monuments we have built are not our own", he looked to create art that was "American, drawn from American sources, memorializing American achievement", according to a 1908 interview article. Borglum's depiction of Lincoln was so accurate, that Robert Todd Lincoln, the president's son, praised the bust as "the most extraordinarily good portrait of my father I have ever seen". Supposedly, according to legend, the marble head remains unfinished (missing the left ear) to symbolize Lincoln's unfinished life. Twelve presidents have lain in state in the Rotunda for public viewing, most recently George H. W. Bush. The tomb meant for Washington stored the catafalque which is used to support coffins lying in state or honor in the Capitol. The catafalque now on display in the Exhibition Hall of the Capitol Visitor Center was used for President Lincoln. The House of Representatives Chamber has 448 permanent seats. Unlike Senators, Representatives do not have assigned seats. The chamber is large enough to accommodate members of all three branches of the federal government and invited guests for joint sessions of Congress such as the State of the Union speech and other events. It is adorned with relief portraits of famous lawmakers and lawgivers throughout history. The United States national motto "In God We Trust" is written over the tribune below the clock and above the United States flag. Of the twenty-three relief portraits only Moses is sculpted from a full front view and is located across from the dais where the Speaker of the House ceremonially sits. The general public has paid respect to a number of individuals lying in state at the Capitol, including numerous former presidents, senators, and other officials. Other Americans lying in honor include Officers Jacob Chestnut and John Gibson, the two officers killed in the 1998 shooting incident. Chestnut was the first African American ever to lie in honor in the Capitol. The public also paid respect to Rosa Parks, an icon of the civil rights movement, at the Capitol in 2005. She was the first woman and second African American to lie in honor in the Capitol. In February 2018, the evangelical Rev. 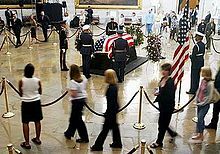 Billy Graham became the fourth private citizen to lie in honor in the Rotunda. On September 24, 2015, Pope Francis gave a joint address to Congress, the first Pope to do so. In 2004, the capitol was briefly evacuated after a plane carrying the then governor of Kentucky strayed into restricted airspace over the district. A shooting incident occurred in March 2016. One female bystander was wounded by police but not seriously injured; a man pointing a gun was shot and arrested, in critical but stable condition. The city police of Washington D.C. described the shooting incident as "isolated". The opening ceremony of the Capitol Visitor Center in December 2008. The plaster cast model of the Statue of Freedom is in the foreground. Apotheosis of Democracy by Paul Wayland Bartlett, a pediment on the east front of the House of Representatives Portico. The Capitol is pictured on the back of the United States fifty-dollar bill. ^ "The United States Capitol: An Overview of the Building and Its Function". Architect of the Capitol. Retrieved November 5, 2010. ^ Crew, Harvey W.; William Bensing Webb; John Wooldridge (1892). Centennial History of the City of Washington, D. C. Dayton, Ohio: United Brethren Publishing House. p. 66. ^ L'Enfant identified himself as "Peter Charles L'Enfant" during most of his life, while residing in the United States. He wrote this name on his "Plan of the city intended for the permanent seat of the government of t(he) United States ...." (Washington, D.C.) and on other legal documents. However, during the early 1900s, a French ambassador to the U.S., Jean Jules Jusserand, popularized the use of L'Enfant's birth name, "Pierre Charles L'Enfant". (Reference: Bowling, Kenneth R (2002). Peter Charles L'Enfant: vision, honor, and male friendship in the early American Republic. George Washington University, Washington, D.C. ISBN 978-0-9727611-0-9). The United States Code states in 40 U.S.C. § 3309: "(a) In General.—The purposes of this chapter shall be carried out in the District of Columbia as nearly as may be practicable in harmony with the plan of Peter Charles L'Enfant." The National Park Service identifies L'Enfant as "Major Peter Charles L'Enfant" and as "Major Pierre (Peter) Charles L'Enfant" on its website. ^ a b Kornwolf, James D; Kornwolf, Georgiana Wallis (2002). "The Creation of the Federal City: Washington". Architecture and Town Planning in Colonial North America: Vol. 3. Baltimore, Maryland: The Johns Hopkins University Press. p. 1552. ISBN 0801859867. OCLC 45066419. Retrieved October 29, 2016. A final legacy of Jefferson's vision of the city is found in correspondence between him and L'Enfant. Jefferson consistently called the building to house Congress, the "Capitol," whereas L'Enfant just as consistently referred to it as "Congress House." At Google Books. ^ (1) L'Enfant, Peter Charles (1791). "Plan of the city intended for the permanent seat of the government of t(he) United States : projected agreeable to the direction of the President of the United States, in pursuance of an act of Congress passed the sixteenth day of July, MDCCXC, "establishing the permanent seat on the bank of the Potowmac": (Washington, D.C.)". Photocopy of annotated facsimile created by U.S. Coast and Geodetic Survey, Washington, D.C. (1887). Library of Congress. Retrieved January 26, 2016. (2) "Enlarged image of central portion of The L'Enfant Plan for Washington" (PDF). National Park Service. Retrieved October 23, 2009. (3) Vlach, John Michael (Spring 2004). "The Mysterious Mr. Jenkins of Jenkins Hill". Capitol History: The Capitol Dome. United States Capitol Historical Society. Archived from the original on July 5, 2008. Retrieved September 14, 2009. ^ www.merriam-webster.com, entries "capitol" and "capital". ^ "William Thornton (1759–1828)". Library of Congress. Retrieved July 7, 2007. ^ Jefferson, Thomas (July 17, 1793). "Letter: Jefferson to Washington". Thomas Jefferson and the National Capital. University of Virginia. Archived from the original on February 21, 2011. Retrieved December 11, 2008. 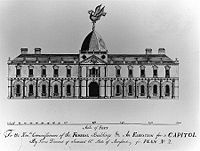 ^ "United States Capitol, Washington, D.C.: East Front Elevation, Rendering". World Digital Library. Retrieved February 13, 2013. ^ Woods, Robert O. (June 2003). "Under the Capitol Dome". Mechanical Engineering Magazine. The American Society of Mechanical Engineers. Archived from the original on January 26, 2009. Retrieved December 11, 2008. ^ "A Brief Construction History of the Capitol". Architect of the Capitol. Retrieved December 11, 2008. ^ Morgan, J.D. (1899). "Maj. Pierre Charles L'Enfant". Records of the Columbia Historical Society. 2: 120. ^ Allen, William C. (1995). In the Greatest Solemn Dignity: The Capitol's Four Cornerstones. Government Printing Office. p. 7. ^ Carter II, Edward C. (1971–1972). "Benjamin Henry Latrobe and the Growth and Development of Washington, 1798–1818". Records of the Columbia Historical Society: 139. ^ "Religion and the Founding of the American Republic". U.S. Library of Congress. July 23, 2010. Retrieved September 23, 2011. ^ "The History of the United States Capitol". YouTube. Retrieved February 19, 2012. ^ "Capitol slave labor studied". The Washington Times. Associated Press. June 1, 2005. Archived from the original on June 4, 2005. ^ "Timeline". White House Historical Association. Archived from the original on May 19, 2007. Retrieved June 10, 2007. ^ "Capitol Dome". Architect of the Capitol. Retrieved May 2, 2017. ^ a b Steinhauer, Jennifer (August 24, 2012). "Dome Is Imperiled by 1,300 Cracks and Partisan Rift". The New York Times. Retrieved October 4, 2012. 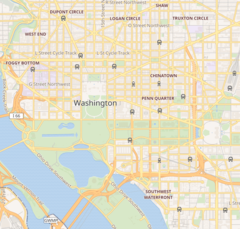 ^ "District of Columbia – Inventory of Historic Sites" (PDF). District of Columbia: Office of Planning. Government of the District of Columbia. September 1, 2004. Archived from the original (PDF) on July 17, 2009. Retrieved August 9, 2009. ^ "America's Favorite Architecture". Harris Interactive. American Institute of Architects. 2007. Retrieved August 9, 2009. ^ "World Architecture Images- U.S. Capitol". American-architecture.info. Archived from the original on October 26, 2010. Retrieved November 5, 2010. ^ "Capitol Visitors Center FAQ". Architect Of the Capitol. Retrieved December 4, 2008. ^ a b "Capitol Dome Restoration Project Overview". Architect of the Capitol. Retrieved November 12, 2014. ^ "Capitol's historic dome set for 2-year renovation". Winston-Salem Journal. Associated Press. December 26, 2013. Retrieved December 26, 2013. ^ "Dome Restoration Project Updates". Architect of the Capitol. Retrieved October 19, 2016. ^ Bresnahan, John (February 26, 2007). "House Ends Cell Phone Licensing Deal". Politico. Retrieved January 11, 2019. ^ Kucinich, Jackie (October 26, 2005). "Hastert rebuffs Pelosi on investigation request". The Hill. Retrieved January 11, 2019. ^ "AOC.gov". AOC.gov. Retrieved November 5, 2010. ^ "Frieze of American History". Aoc.gov. Retrieved November 5, 2010. ^ "U.S. Senate: Art & History Home, First Reading of the Emancipation Proclamation of Presid". Senate.gov. Retrieved February 19, 2012. ^ a b "Abraham Lincoln Bust". Architect of the Capitol. Retrieved May 2, 2017. ^ "365 Steps to the Top of Capitol Hill". The New York Times. August 10, 1997. Section 1, Page 22. Retrieved August 9, 2009. ^ Logan, Mrs. John A. (Mary Simmerson) (1901). Thirty Years in Washington; or, Life and Scenes in Our National Capital. Hartford, Connecticut: A. D. Worthington & Co. p. 78. OCLC 29540458. Retrieved August 9, 2009. ^ Bowman, Bridget (July 21, 2014). "Muslim on Capitol Hill: Staffers Look to Rebuild". Roll Call. Retrieved January 17, 2017. ^ Matthew Gilmore. "H-DC Discussion Network". H-net.org. Retrieved November 5, 2010. ^ Carrier, Thomas J. (2000). The White House, the Capitol, and the Supreme Court: historic self-guided tours. Images of America. Charleston, South Carolina: Arcadia Publishing. p. 84. ISBN 0-7385-0557-9. OCLC 44503337. Retrieved August 9, 2009. 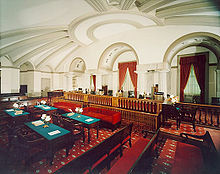 ^ "The Senate Chamber 1859–2009". Retrieved January 26, 2009. ^ "The Senate Chamber: Senate Vice Presidential Bust Collection". United States Senate. Retrieved December 6, 2007. ^ "Billy Graham Will Be the Fourth Private Citizen Ever to Lie in Honor at the U.S. Capitol". Time. Retrieved March 8, 2018. ^ "Apostolic Journey - United States of America: Visit to the Congress of the United States of America (Washington D.C., 24 September 2015) | Francis". w2.vatican.va. Retrieved March 19, 2016. ^ Kessler, Ronald (November 9, 1983). "Capitol Bombing: Group Hit Other Targets, FBI Believes". The Washington Post. ^ Seppy, Tom (February 12, 1985). "Judge Finds Four in Contempt in Bombing Probe". Associated Press. ^ Rowley, James (September 7, 1990). "Three Leftists Plead Guilty to Bombing the U.S. Capitol". Associated Press. ^ "Al-Jazeera offers accounts of 9/11 planning". Archived from the original on February 20, 2006. Retrieved June 3, 2008. ^ "Increased Security on Capitol Grounds" (Press release). United States Capitol Police. August 2, 2004. Archived from the original on November 1, 2006. Retrieved September 26, 2006. ^ a b Lyndsey Layton and Manny Fernandez (August 3, 2004). "Street Closing Irks D.C. Leaders: Checkpoints Set Up Near World Bank, IMF and Capitol". The Washington Post. Retrieved September 26, 2006. ^ Post Store (January 29, 2006). "WashingtonPost.com". The Washington Post. Retrieved November 5, 2010. ^ Michael S. Schmidt (March 28, 2016). "U.S. Capitol on Lockdown After Reports of Gunshots". The New York Times. Retrieved March 28, 2016. ^ "US Capitol shooting: Gunman wounds Capitol police officer". BBC News Online. March 28, 2016. Retrieved March 28, 2016. ^ "Architecture – U.S. Capitol Visitor Center". Architect of the Capitol. Retrieved March 4, 2017. ^ Philip Kopper "A Capitol Attraction," American Heritage, Spring 2009. ^ "Capitol Visitor Center: Project Information". Architect of the Capitol. Archived from the original on November 1, 2008. Retrieved November 10, 2008. ^ "Congress' Newest Member: The US Capitol Visitor Center". Washingtonian magazine. November 8, 2008. Retrieved March 3, 2017. ^ "Capitol Visitor Center Fact Sheet" (PDF). Architect of the Capitol. Spring 2008. Archived from the original (PDF) on October 31, 2008. Retrieved November 14, 2008. Allen, William C. (2001). History of the United States Capitol – A Chronicle of Design, Construction, and Politics. Government Printing Office. ISBN 0160508304. OCLC 46420177. Archived from the original on April 23, 2002. Retrieved October 29, 2016. Brown, Glenn (1998). Architect of the Capitol for The United States Capitol Preservation Commission, ed. History of the United States Capitol (Annotated Edition in Commemoration of The Bicentennial of the United States Capitol ed.). Government Printing Office. Archived from the original on December 7, 2008. Guy Gugliotta (2012). Freedom's Cap: The United States Capitol and the Coming of the Civil War. Farrar, Straus and Giroux. ISBN 978-0-8090-4681-2. Hazelton, George Cochrane (1907). The National Capitol. J. F. Taylor & Co.
Aikman, Lonnelle. We, the People: the Story of the United States Capitol, Its Past and Its Promise. Washington, D.C.: U.S. Capitol Historical Society, in cooperation with the National Geographic Society, 1964. Bordewich, Fergus M. (December 2008). "A Capitol Vision From a Self-Taught Architect". Smithsonian Magazine. 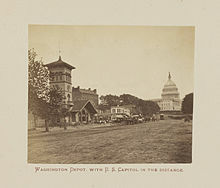 Wikimedia Commons has media related to United States Capitol. Capitol History Project—documentary and website by C-SPAN. Committee for the Preservation of the National Capitol Records, 1949–1958. Held by the Department of Drawings & Archives, Avery Architectural & Fine Arts Library, Columbia University. Unknown Tallest Building in Washington, D.C.